character, related development patterns, of an environment specific to a period of time. Tacoma has eight historic districts, including four that are listed on the local Tacoma Register (TR), seven that are listed on the National Register of Historic Places (NR), and seven that are listed on the Washington Heritage Register (WR). There are no pending historic district nominations at this time. Areas that are listed on the Washington State Heritage Register must be nominated and approved by the Governor's Advisory Council on Historic Preservation. For districts to be nominated to the National Register of Historic Places, the nomination is reviewed by the Landmarks Preservation Commission, the State Historic Preservation Officer, and the Governor's Advisory Council on Historic Preservation. If the nomination is successful at the local and state level, a recommendation is forwarded to the federal Advisory Council on Historic Preservation. Neither state nor federal listing creates restrictions on private property owners. Properties subject to Shoreline permits, SEPA, or federally required permits. 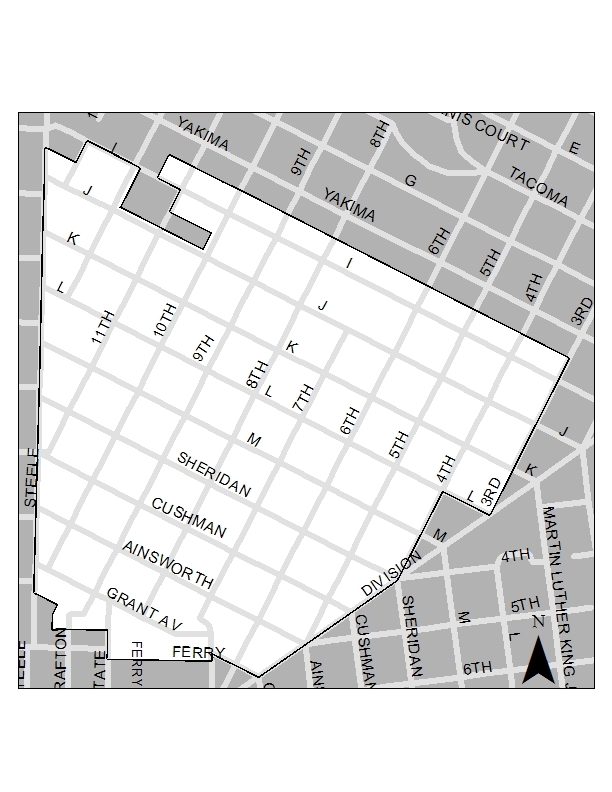 The Wedge Neighborhood Historic District was established on May 24, 2011 (City Council Ordinance #27981), in response to a request submitted in 2008 by neighborhood residents.The Wedge Neighborhood is significant for its representation of a pre-WWII, middle class, Tacoma neighborhood. The profiles of its residents--which cut across professions and backgrounds--tell a typical story of an emerging community. The original Wedge settlers were a diverse group of people from all walks of life and from many parts of the world. Many early residents were born in Germany, Sweden, Norway, and England. They brought their languages, foods, cultures, and religions. Some homeowners took in boarders and extended-family members. The population included pioneers, successful merchants and businessmen, European immigrants, westward travelers, as well as laborers, professionals and civil servants. 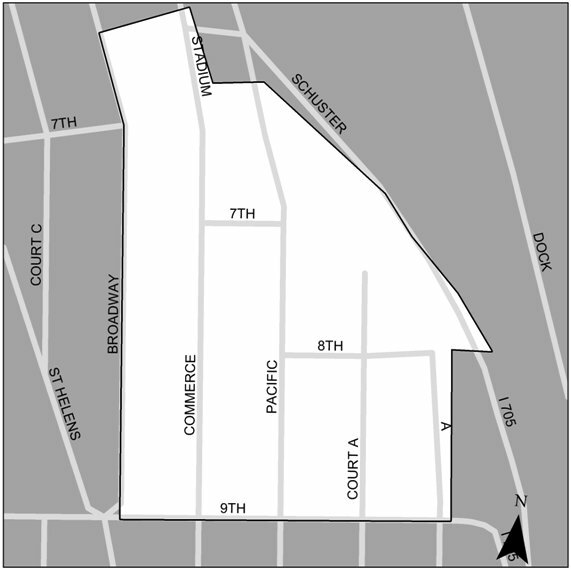 The Wedge Neighborhood Conservation District is intended to “buffer” the core historic district from the impact of development in the surrounding area. The North Slope Historic Special Review District, with more than 950 properties, is one of the largest historic districts in the country. It was listed on the Tacoma Register in 1994 (expanded in 1996 and 1999), as well as the Washington State and National Registers of Historic Places in 2003.This district was created in response to an initiative from residents who valued the atmosphere these historic homes create. Few homes in the district are high-style; instead the neighborhood is composed primarily of middle class Victorian, Craftsman, Colonial Revival, and Foursquare houses. They represent a collection of Pacific Northwest versions of the residential architecture popular in the United States prior to World War II.Current residents still take great pride in their historic homes and beautiful streets as they enjoy the traditional neighborhood lifestyle. Street signs mark the extent of the district, which extends from North I Street to North Grant Avenue, and between Division Avenue and Steele Street, along the angle where Tacoma's street grid follows the shoreline and links Old Town (developed in the 1870s) with New Tacoma which was built to meet the railroad line in the 1890s. 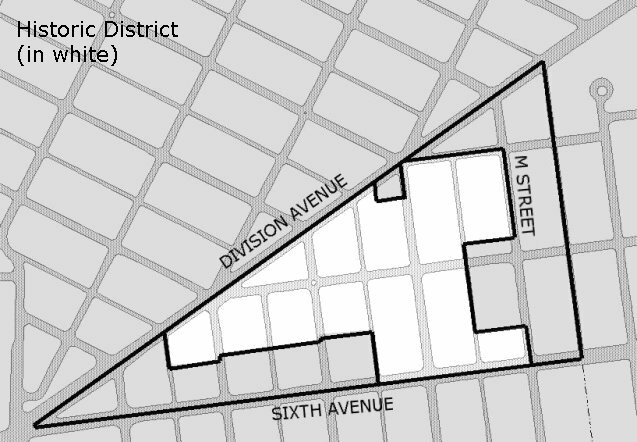 North Slope Historic Special Review District Requirements - What Gets Reviewed? 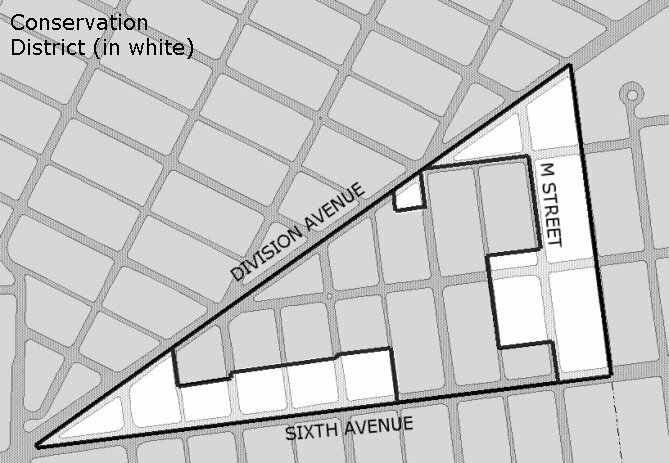 If your house is located within the boundaries of the historic district, then changes to the exterior of your property may require design review by the Landmarks Preservation Commission if permits are required, as stated in TMC 13.07.360. This includes changes to windows, siding, additions, chimneys, porches, and decks. Old City Hall (1892) reflects the grand ambitions of the time. It is an outstanding example of the height of Italianate style in America. Other striking buildings are found throughout the district, including the Northern Pacific Headquarters (1888), the Beaux Arts Elks Temple (1916), and the Winthrop Hotel (1925). Smaller brick buildings also remain as reminders of Whiskey Row, the entertainment district that once thrived on the wages of dock workers and politicians. New uses continue as buildings are rehabilitated for office, retail, and unique urban residences, maintaining the historic character of old Tacoma. The Union Depot-Warehouse Historic District (National Register of Historic Places-1980; Tacoma Register-1983) flanks Pacific Avenue from South 17th Street to South 23 Street and extends up the hill to Jefferson Avenue. The district is surrounded by the Union Station Conservation District. Properties within the surrounding Union Station Conservation District must also be reviewed for exterior changes. Architecture in the district is characterized by rugged brick warehouses and factories-- examples of commercial high style and industrial vernacular architecture that developed in America during the early 1900s. The district was a hub for goods that arrived by railway during the 1890s through the 1920s. Union Station (1911) is a stunning landmark, with its massive arches and copper clad dome. The adaptive reuse of Union Station as a Federal Courthouse earned the City of Tacoma a National Preservation Honor Award in 1994. In 1999, Tacoma received a second National Preservation Honor Award for the University of Washington, Tacoma’s adaptive reuse of the warehouse buildings along Pacific for its new urban campus. Other buildings in the district are being rehabilitated for use as apartments, businesses, restaurants, and shops. These projects are outstanding examples of historically sensitive adaptive reuse. 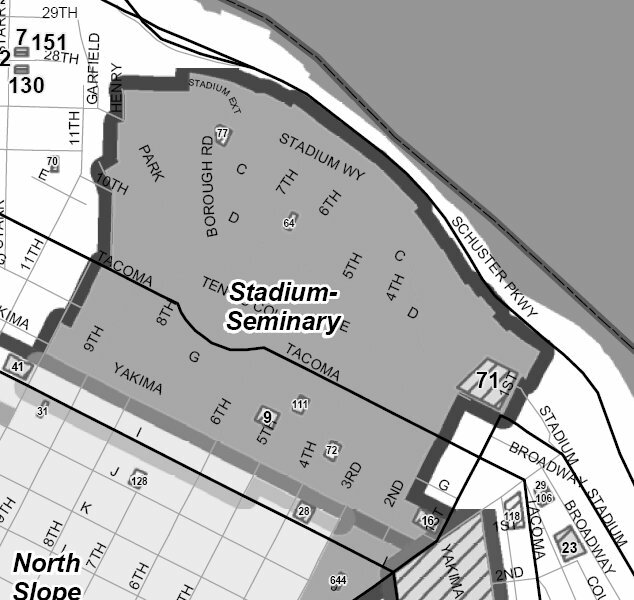 Tacoma's high-style residential district, the Stadium-Seminary National Historic District, is listed on the National Register (1977). This district occupies beautiful tree-lined avenues between North I Street and the shoreline, and between First Street and North 10th Street. With its stunning views of the Puget Sound, the district provides insight into the lives of the early lumber barons and railroad executives. 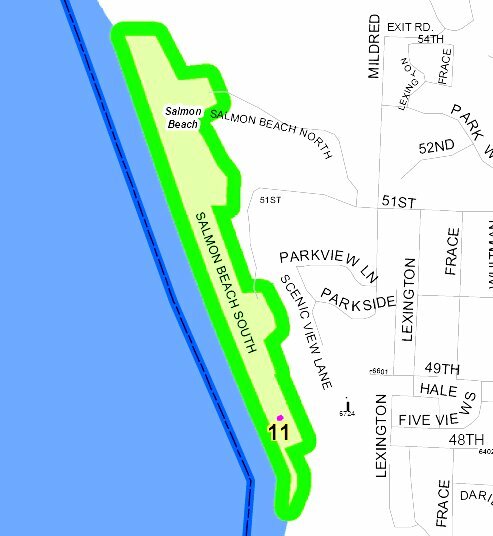 The Salmon Beach Historic District is listed on the Washington Heritage Register; it represents a rare glimpse of the waterfront lifestyle from the first part of the 20th century. The original community was a collection of approximately 100 cabins built on stilts at the base of a steep bluff bordering the Tacoma Narrows. Several cabins, including Cabin #97 (listed on the National Register of Historic Places) are in close to original condition, representing the small, intimate, and independent character of the historic Salmon Beach community. The Buckley’s Addition Historic District was added to the National Register of Historic Places in 2016. 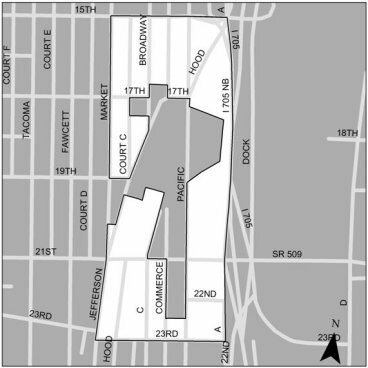 It is roughly bordered by North Steele Street, North 8th Street, North Pine Street, and North 21st Street. It includes 592 primary buildings, 430 of which are Historic Contributing properties. Architectural types include Queen Anne, Colonial and Tudor revivals, Foursquare, and Craftsman. The district represents the broad pattern of social and economic history of Tacoma and is a typical early 20th century street-car suburb. The district is named for James M. Buckley, who was the Assistant General Manager of the Northern Pacific Railroad. Buckley purchased several large homestead claims and platted Buckley’s Addition, which was filed on June 12, 1883. Development began in the south section and continued until 1941, when only 8% of the lots were still undeveloped. The College Park Historic District was added to the National Register of Historic Places in 2017. 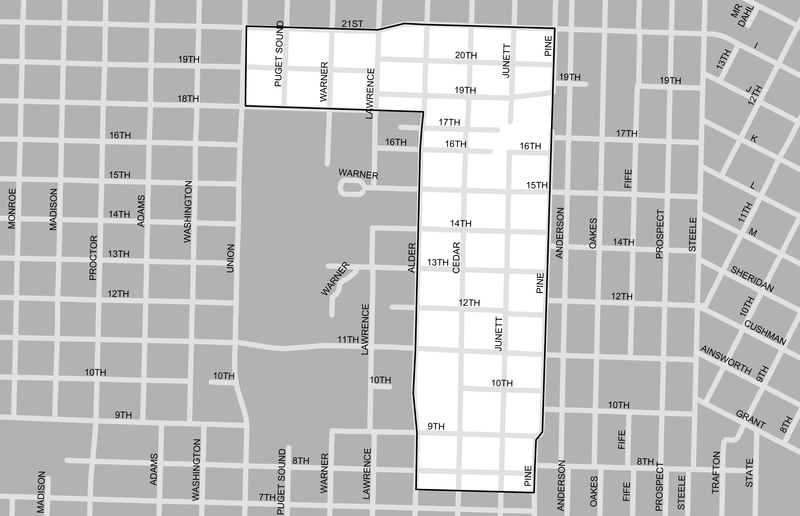 The district is 125 acres roughly bordered by North Pine Street on the east; North 21 Street on the north; North Alder Street and North Union Avenue on the west; and North 8th & North 18th adjacent to the University of Puget Sound, on the south. It includes 582 primary buildings, 509 of which are contributing properties. Architectural types include Queen Anne; Colonial and Tudor revivals, Minimal Traditional, and Craftsman. The period of significance is 1890 to 1960, during which most of the homes were built. 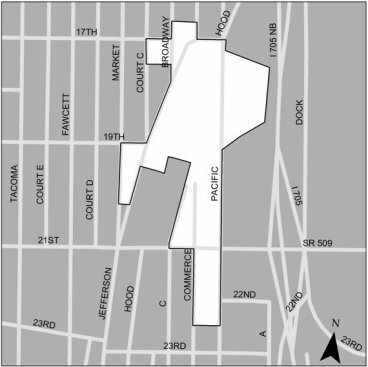 The district represents the broad pattern of social and economic history of Tacoma. College Park also embodies the distinctive characteristics of homes from this period and includes the work of master craftsmen and architects.